What does it mean that HCI-Telehealth 360 is a device-free-technology? Telehalth 360 is designed to accommodate both patients and providers to achieve the best health care outcomes in a very simplistic and inexpensive way. There is no need for complex gadgets that cost thousands of dollars when we can utilize off-the-shelve equipment that is familiar, inexpensive and can be used by anyone. Studies show that 95 % of patients can use a telephone set to transmit accurate digital data such as blood pressure, blood sugar or Oxygen saturation level. 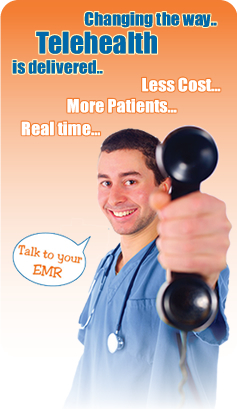 Imagine a patient talks to his electronic medical record; be asked questions. And while on the phone alerted to what is wrong and directed to what is right. Imagine that the electronic Medical record alerts the patient health care provider instantly through a text message and get them on the phone if needed while the patient still holding the hand set to solve a problem and prevent a hospitalization and an ER visit. Imagine a fax goes to the patients physical office updating the physician chart with weekly readings or out of range data i without a human intervention and imagine all of this to continue where patient and there providers enjoy life and reduce stress.. Imagine a patient is reminded every time he or she needs to take medication and imagine if 5 days before running out of those medications, the electronic Medical record connects the to the pharmacy database to punch the prescription number and get a refill. Telehealth 360 offers combined practical solutions for many of the issues that faced disease management and remote monitoring in the last decades.